Frederick II (died 10 October 1213) was the duke of Lorraine from 7 April 1206 to his death, son of Frederick I and Ludmilla, daughter of Mieszko III the Old, monarch of Poland from the Piast Dynasty. 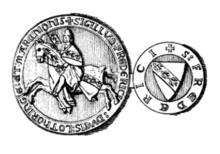 In 1179, a three-year civil war ended in Lorraine and Duke Simon II was forced to agree to the Treaty of Ribemont, whereby Lorrain was divided: the northern, germanophone half going to Simon's brother Frederick and the southern, francophone half to Simon, who had tried to appease Frederick by giving him the county of Bitche. Simon designated Frederick's son, Frederick, as his heir and abdicated in 1205. Nonetheless, Frederick was acclaimed duke, but died the next year. His son succeeded him and the duchy was completely reunited. By his 1188 marriage to Agnes of Bar (died 19 June 1226), he received the lands of Amance, Longwy, and Stenay. He entered into a war with his father-in-law, Theobald I of Bar, and was defeated in 1208, being captured and imprisoned for seven months. To obtain his freedom, he relinquished the cities. This page was last edited on 10 April 2018, at 13:52 (UTC).